Today is about a special event, a passion, a new hobby and men. 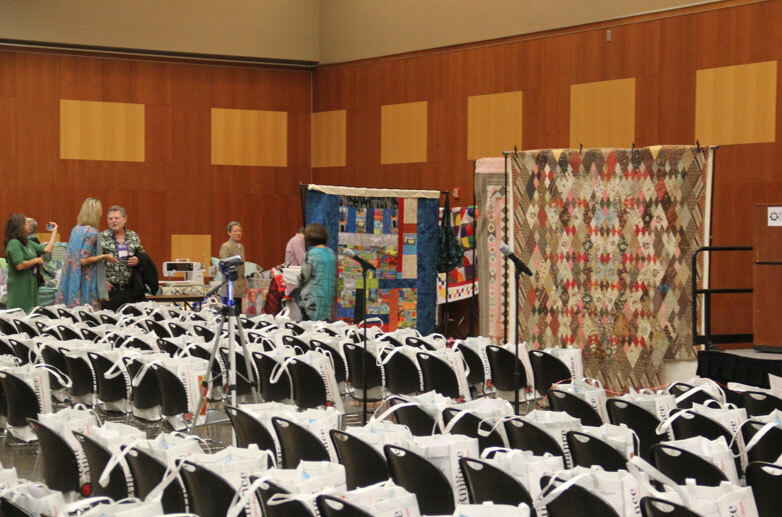 The Quilters Take Manhattan event is a relatively new thing – this is the fifth year it’s been held. Moda/United Notions is a long-time sponsor of the Alliance because of Mark Dunn’s passion for documenting history, particularly the history of quilts and quilters. One of the highlights of last year’s event was a presentation featuring some of Mr. Dunn’s antique quilts, a few of which have been reproduced as Collection for a Cause quilts. That’s Mr. Dunn on the left, speaking with Amy Butler before the attendees arrived and the fun started. One of the missions of the Quilt Alliance is creating a body of information about quilt-making by capturing the voices and stories of quiltmakers for the Quilter’s S.O.S. – Save Our Stories. 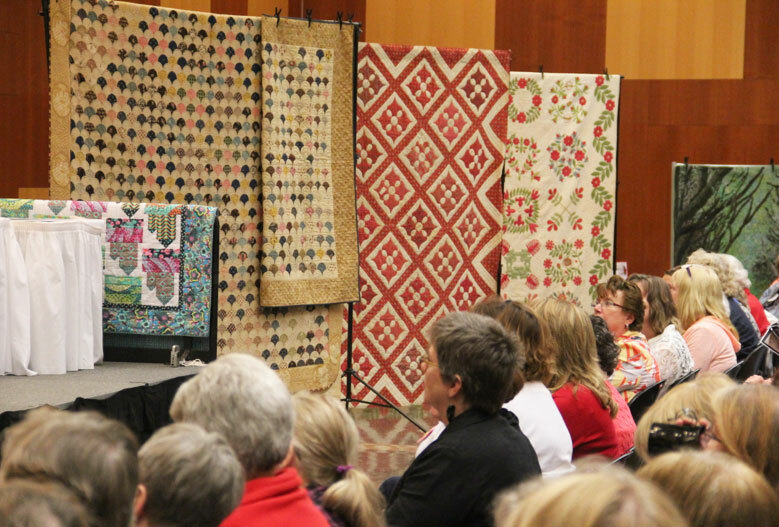 A highlight of the event is the recording of an interview with a notable, acclaimed quilter. This Saturday, Edyta Sitar of Laundry Basket Quilts will be interviewed by Meg Cox, a journalist and author, and a member of the Board of Directors for the Quilt Alliance. Seabreeze by Edyta Sitar – using her upcoming (and awesome) Silver Lining Shirtings. That got me thinking about men in the “quilting industry”. Then I thought of Jeffrey Gutcheon of Gutcheon Patchworks. He was a “famous quilter” when I first started quilting in the early 1980s and while I did once own the Perfect Patchwork Primer, I remember the name primarily because of his fabric – called American Classic. It was cool and different and amazing – definitely not my grandma’s calico. And there’s Michael James – a renowned artist, quilter, author and teacher. Michael James’ Rhythm Color Spanish Dance. While looking for the links of the men on my list, I found a better list compiled by Raymond K. Houston – Nacho Grandma Quilts, Raymond lists more than 117 male quilters. I also learned that AQS had published a book in 2010 – Men and the Art of Quiltmaking by Joe Cunningham – featuring the work of thirty men. If you’re wondering where this is all going… at the United Notions Open House last month, Mr. Dunn talked about his new hobby – he’s started quilting. So of course I had to ask for more details… specifics. After 40 years in business, I have recently taken an interest in quilting and find it to be relaxing and therapeutic. I had someone sit down with me and teach me how to operate a sewing machine. For a man, that’s the fun of it, learning to operate the machinery. Then how to piece the fabric together becomes the challenge. But once I pieced together some pre-cut mini charms I was hooked. I feel men would enjoy quilting because it is challenging, relaxing, and fun. I appreciate the challenge of the geometry and the art of the craft. I was recently at the National Quilt Museum and they had a class that included both male and female students. About 30% of the classroom was men and they were all enjoying it. Perhaps there are more men out there that want to quilt, but we aren’t catering to them. Educating new quilters and teaching greater skills to experienced quilters will ultimately lead to a stronger, more viable and diverse quilting community. I also wanted to ask what he thought about the stereotype of quilting being a “woman’s interest” or woman’s craft. While there are more men in quilting, the quilting population and the quilting population are still a little skewed. So I asked – most famous artists are men but not many men make quilts or do fiber arts. 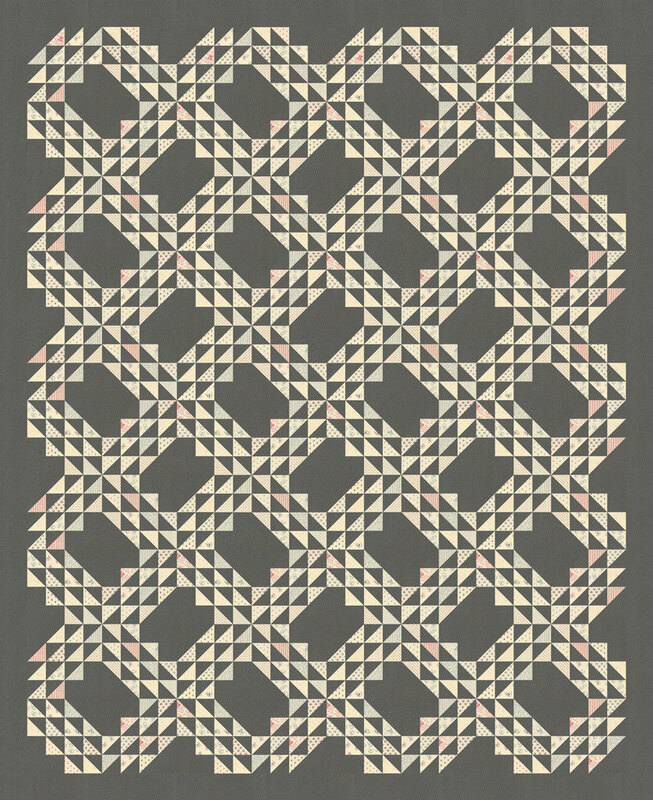 Why don’t more men – and male artists – make quilts? I believe that quilting is perceived as a woman’s craft so therefore men typically stay out of creating quilts. Although I do feel that this stereotype is changing with the inclusion of more male artists in our industry. Finding time to sew is like any other hobby – if it interests you, you will make the time. Moda’s Marketing Manager raised five children, worked a full-time job, and still found time to be a prolific quilter. Perhaps it was the therapy she needed to handle all of that responsibility. That’s it for today. I’ll be back Friday with a little bit more from the y-side of quilting. Jeff Gutcheon’s American Classic lines were ahead of their time and I still have a small stash of them which filter into my current work! And I learned some great hand quilting tips from Michael James in the 1980’s that I still use!! Love the article and I can hear it in your writing how much you love your job. Truly sounds like a great place to work with wonderful people. 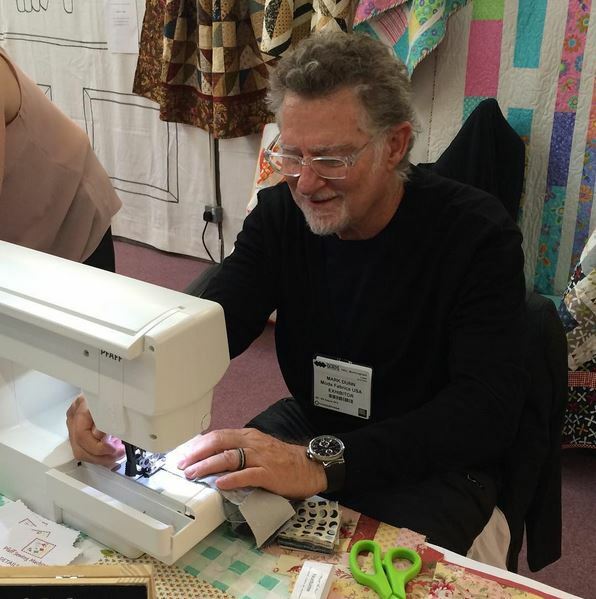 We have 3 men in our quilt guild and they will be the feature quilters at another local guild’s show in October – they were our feature quilters for our show last year and were quite the draw to their ‘Man Cave’. Great post as usual, but I just want to add you are missing my favorite man quilter, Tim Latimer http://timquilts.com/ and his quilt inspector Teddy. He works with antique quilt restoration as well as stitching up new quilts of his own designs. Yours and Tim’s blog entries are at the top of my favorite reads. Then there is the new guy on the scene too – Rob Appell, who is fun to watch on youtube. Fun to see Mr. Dunn joining your list! Seamen pieced and quilted artistically from days of sailing ships. I am aware of a few museum pieces – small quilts made from English uniform pieces – from various quilt books I’ve read. Soldiers pieced and sewed tops to their blankets, again museum pieces. Traveling sewing machine salesmen would demonstrate their machines by foundation piecing strings on newspaper squares. Production commercial quilting is also a take on quilting by men and includes everything from commercially quilted mattress pads, moving pads for furniture, quilted winter jackets to insulation on space craft. The last is currently being done by a woman. Why do we act surprised that men quilt or know how to use a sewing machine? Aren’t most of men’s suits tailored by men — making those gorgeous suits out of fabulous fabrics tailored to fit? Hurrah for all quilters! Fabulous informative posting. I can’t wait to visit these sites. Thank you Carrie. Another very talented man in the quilting industry is Jason Yenter. Brilliant designer and accomplished quilter. He learned from his mother Sharon Yenter who was a pioneer in quilting in the Seattle area. Another great read! I’ve always loved your patterns hope you always continue to design & offer. Now I thank you Carrie for joining Moda & writing/sharing of such great varied information about the current world of quilting! You are truly inspiring! How interesting, more men in quilting than I thought ! I dabble but it is not my main craft interest. I do find it a very relaxing and enjoyable experience ! 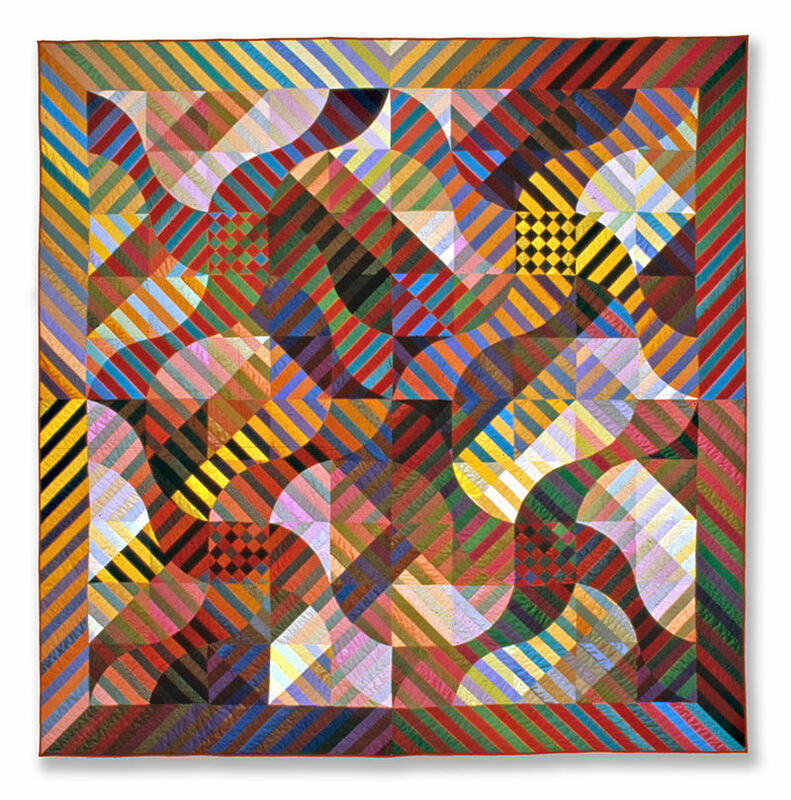 You might want to add Arnold Savage to the list – he made quite a stir when he was the first man to have a quilt in the Paducah AQS show (the only show back then) and he is still quilting. Regarding men as quilters… When I was on a quilting tour in 2013, it included a tour of the DAR musuem ( Daughters of the American Revolution ) in Washington D.C. There, we were shown a woollen quilt made up in red, black and white/cream with small pieces, squares, diamonds – magnificient………… made by civil war soldiers. Go and have a look at this quilt as there is no way I could make it, maybe DAR would be happy to send Moda a photo?, maybe they have more quilts made by men. Thank you Mr Dunn. Loved this posting….. Maybe because just recently my husband expressed an interest in learning to quilt:) I have 3 working sewing machines so it’s just finding the time to teach him (and my 5 year old grandson too)!